SEAVIEW PENTHOUSE at Seaside Beach: Seaview condominiums is the newest oceanfront luxury property in Seaside. Offering high end amenities. 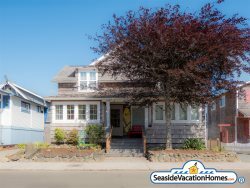 This two bedroom oceanfront Penthouse Unit is located on the fourth floor giving guests a breathtaking view of the coastline stretching from Washington to Tillamook Head along with vaulted ceilings and more windows then lower level units. Elevator access is just steps away from this unit and of course the beach is directly in front of the building. Also located on the north end of the prom you are only a 10 min walk from Broadway and all the dining and fun that downtown has to offer. Keep in mind the additional cleaning charge ensures that your house will be spotless upon arrival and that you will not be asked to spend more than 5 min on the check out procedure. See policies for more booking information. HOOD TO COAST 2018 - we are now accepting two night bookings at this location. If you wish to add additional nights we are happy to offer a discounted rate on third, fourth, etc.